This bright and cheerful pattern has a very inspiring story. 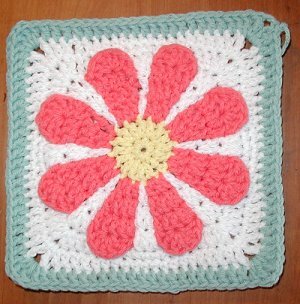 The Daisy Flower Crochet Charity Square by Krystal Nadrutach is designed with the intention of serving the world. The request is that every single person that uses this pattern will crochet one square and mail it to the designer so she can make blankets to donate to local charities. I love the “payback” idea, so inspirational! What a perfect vehicle to use up scraps and serve a charitable purpose. 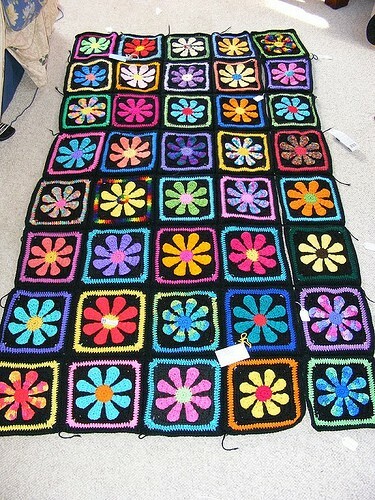 This is one of the afghans being assembled from the squares sent in from around the world. There are three continent on this one: Europe (UK), N. America (Canada & US) and Australia (NSW, QLD). UPDATE : This pattern has bee updated to PAID. There’s a small fee you need to pay now in order to get the pattern. Thanks to Krystal Nadrutach for this article inspiration and images. Thanks for noticing Judy Coley Lovell! It used to be free,till recently, now indeed is a small fee for the pattern.